I've got plans for this room too! If only I could finally decide what I want. My lovely living room. The carpet and drapes were tossed. 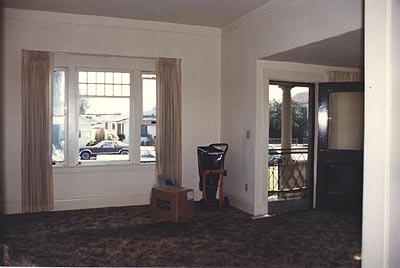 I have a nice window looking out onto the street and once the carpet was out the house was much lighter and warmer. Same view in an interim mode. 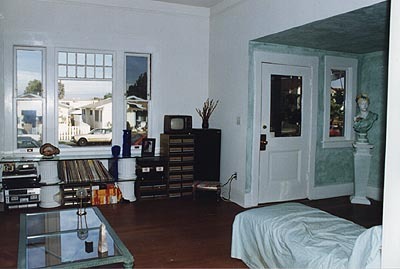 I've removed the window treatments and painted the room white. You'll see the foyer is washed with a nice green. There are more plaster columns and glass. You can see that the front door has a large piece of glass in it. It is beveled around the edge and I am pretty sure it is the original door to the house which was moved there when the original porch was enclosed. Standing by the couch looking toward the foyer. I eventually replaced my old butcher block table with a smaller aluminum garden table and two chairs which are more in scale with the area. Here is the view from the foyer towards the couch. In other words this is what you would see if you looked to the right as you entered the front door. I love the architectural prints which are of Greek columns and also influenced the use of the plaster columns. I'll eventually be washing the walls gray, adding a Greek wallpaper border along the top and track lighting. 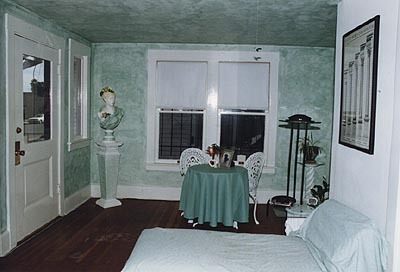 And I'd like to do a faux marble finish on all the wood trim in this room. Well, after the bathroom was remodeled the living room underwent some changes too. The walls were painted and I finally hung some wallpaper border I bought at Home Depot and held on to for ten years. 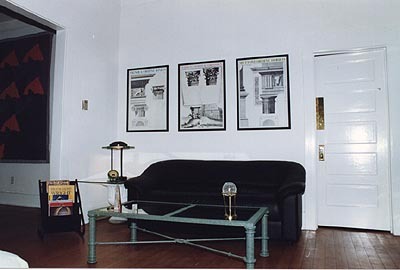 The coffee table and end tables have been reused. The coffee table is now outside in the front yard under the pergola. Much of the plaster and glass is relocated or in the garage. After the floors were refinished I've added more wood pieces because the floors came out so nice. But many of the pieces and accessories are still there.